LG HX906TX review | What Hi-Fi? Extended surround sound. It sounds great, but finding room for five speakers and a subwoofer can be tough enough, so adding even more is a stretch too far for many. That’s why the LG HX906TX seems such a sweet deal. Those four, lovely looking speakers have extra, upward-firing drivers to create a 9.1 sound field from what would normally be considered a 5.1 system. The good news is that it works, at least to an extent. Turn the 3D Sound mode on and those upward firing drivers spring into life and, thanks to a “360° Reflector”, send sound up and out to fill the room from floor to ceiling. Play the battle of Khazad-dum scene from the first Lord of the Rings Blu-ray, and the expansive surround field recreates the massive caves in style. The problem is that it also sounds rather bright, so the sword-on-sword action can grate. Interestingly, switching 3D Sound off cures this, and results in a far nicer tonal balance. Unfortunately the speakers struggle to disperse sound properly without those extra drivers, so you end up with big gaps in the surround field. So, it doesn’t sound as good as it should with 3D Sound turned on or off, but at least the picture is excellent, with superb detail, definition and motion, in both 2D and 3D. LG’s smart offering is better than most, too, with a bustling app store as well as the BBC iPlayer, Acetrax, YouTube and, in the near future, Blinkbox. 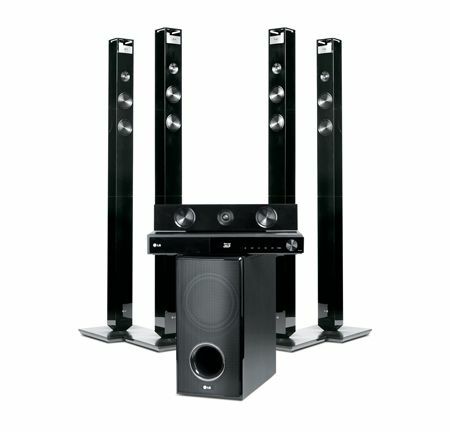 However, if you want all that you can get it from another LG, the HX976TZW – and that sounds better, too.